Finance Minister Piyush Goyal has proposed many changes in tax rules in Budget 2019. We present you 5 key changes that would impact all income tax payers. This would only benefit people with taxable income below Rs 5 lakh. Had there been reduction in the tax slab it would have benefited every tax payer. The standard deduction available to Salaried & Pensioners have been increased from Rs 40,000 to Rs 50000. This would reduce the tax liability up to Rs 3,558 in the highest tax slab. Until this year, if someone had more than one house, he could show one house as self-occupied while all other houses have to be either classified as rented (if it was actually rented) or deemed to be rented (if vacant or self-occupied). In case of “deemed to be rented” the tax payer had to show notional rental income from those houses and pay taxes on the same. From next financial year FY 2019-20, now you can have two houses as self-occupied. This is good move as many people have to maintain two houses, one for self and other for dependents including parents, children or spouse. However, in case of more than 2 houses, notional income would still hold. Tax payers can save on Long term capital gains arising from sale of house by buying another house under section 54. In Budget 2019, the tax payers can now buy two houses on sale of 1 house if the capital gains are less than Rs 2 crore. This benefit can be availed only once in lifetime. This was good move as many people had to sell one house and buy multiple property to bequeath to their heirs. Learn: How to Save Long Term Capital Gains Tax from Property? Threshold of deducting TDS on interest income from Bank, Post Office or co-operative deposit has been increased from Rs 10,000 to Rs 40,000. Assuming interest rate of 8%, you can deposit Rs 5 lakh in Bank Fixed Deposit and not worry about TDS. I think this is great move as many people had to unnecessary go through TDS and file Income tax returns of fill Form 15G/H. But do remember, that no TDS does not mean no tax. You still need to show the interest income and pay tax if required. 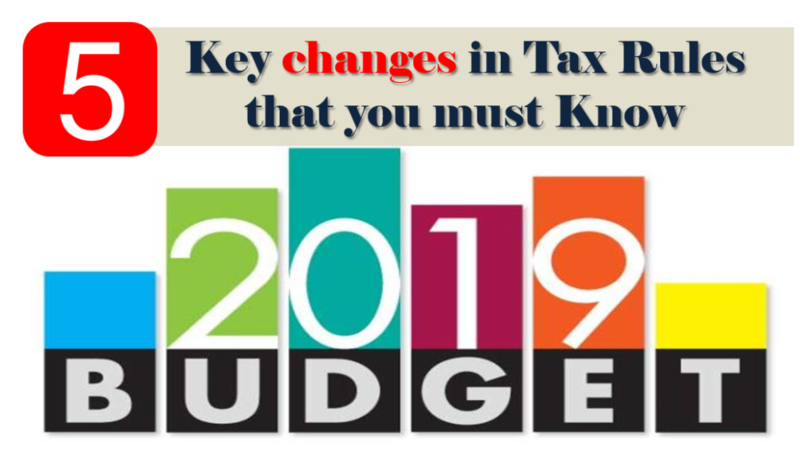 All the above changes would be effective from April 1, 2019 and applicable from FY 2019-20 (AY 2020-21) onwards. Very well summarized the entire Highlights of budget. DO remember to share this and forthcoming slides with your friends and family. It means individuals with taxable income up to Rs 5 lakh will pay zero tax. The income tax rates will remain same for all others.